Are your kids ready for fall? Yes, it’s still blazing hot here in the south, but in a couple of months, we’ll feel that first chill in the air. Then we’ll be hot again and we’ll go back and forth until after Christmas. My son is getting married in November and I’m searching for something for the two youngest grandsons to wear in the wedding. They won’t be wearing tuxedos like the big guys. I found the perfect outfits at Janie and Jack. Even though I have all grandsons, I can’t resist looking at all the cute little girl stuff for fall. At least the grandsons love to dress up. That counts for something, right? Since I can’t keep great fashion (or anything else) to myself, here’s my favorite fall fashions for kids. If you see something you like, click the photo to go to the site. Let’s start with the girls first. This uptown chic outfit will take your little girl from the cafe to the matinee. The ivory bouclé with contrast trim is adorable. Who says that girls get to have all the fun when it comes to fashion? Not me! Check out this Jetsetter Prep look for the guys. These fancy flowers and flouncy chiffon will take your little darling from summer right into fall. Your son will look charming in these soft layers, crisp plaid, and nautical colors. Who can resist this precious pink tweed ensemble? You didn’t think I’d forget about the babies, did you? Be sure and check out the accessories such as handbags, hats, and shoes. Janie and Jack also has an awesome summer sale going on. Which outfit is your favorite? Oh my goodness, cuteness overload with all these fall fashion favourites. I think my nephew would totally rock these outfits big time. So many cute outfits, it’s hard to pick. I had to look at them all several times. Those little girls are so cute. I think I like the outfit with the red vest best from Coastal Club. Congrats on your son’s upcoming wedding! My goodness, more wedding excitement in your family! So exciting! My girls are very much into fashion. I love how cool these little outfits look! And yes, I thought you had forgotten about the cute little babies (glad you included them). Maybe your son will start the line of “girls?” That would be nice. I need to check out the baby clothes. My granddaughter always needs new clothes! Sure, she has plenty, but I can’t resist cute baby clothes. Those fashions are extremely adorable on the kids. It would be fun to dress my kiddo and some of it, as a nice clean look. Janie and Jack is one of my fave stores at the mall. They always have such classic kid’s clothing at great prices! Thanks for letting us know about the sale- I’ll check it out today! Another wedding for you! What a great blessing for your family. 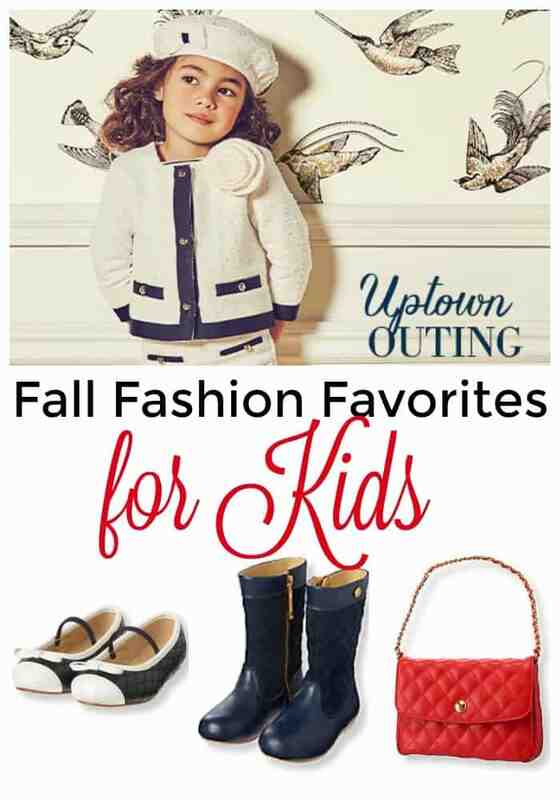 What a stylish collection of fall clothing for kids. They are simply adorable. I wish I had that kind of fashion as a kid! These are some really cute fall looks. I think the parkside styles are probably my favorites! Oh look at those little cute model;s rocking those Fall outfits! I miss shopping for little kids, my children’s taste on clothing is changing and they have their own opinion about it lol. These are some really adorable outfits indeed for the kids. I really love the Uptown Girl outfit which is so elegant and gorgeous for sure. Thanks for sharing these outfits I will have to share this with my sister and niece for their kids. These clothes are so cute!! I am going to buy some of these sets for the kiddos. Oh my gosh, these clothes are so cute! My daughter is at the age where she understands fashion and she just told me she loves these. The kiddos need to look their best for school. These are some great ideas to get them off to a great start. Any kid in these clothes will be the envy of school. I like the fall fashion for kids. It’s stylish and fresh look for kids. I would love to get prep clothes for my kids. So freaking cute, I love to see kids dressed like little adults. These looks are very chic and I would totally put my daughter in this Parkside Social look. Ready to go right from school to the country club. Those are some pretty nice clothes, my little terrors would have them covered in mud in minutes. That tweed outfit! Oh my gosh, that is the cutest thing I have seen this year! My daughter so needs that! These outfits are too cute! I absolutely love the vintage look. Great compilation! Thanks so much for sharing your favorites!